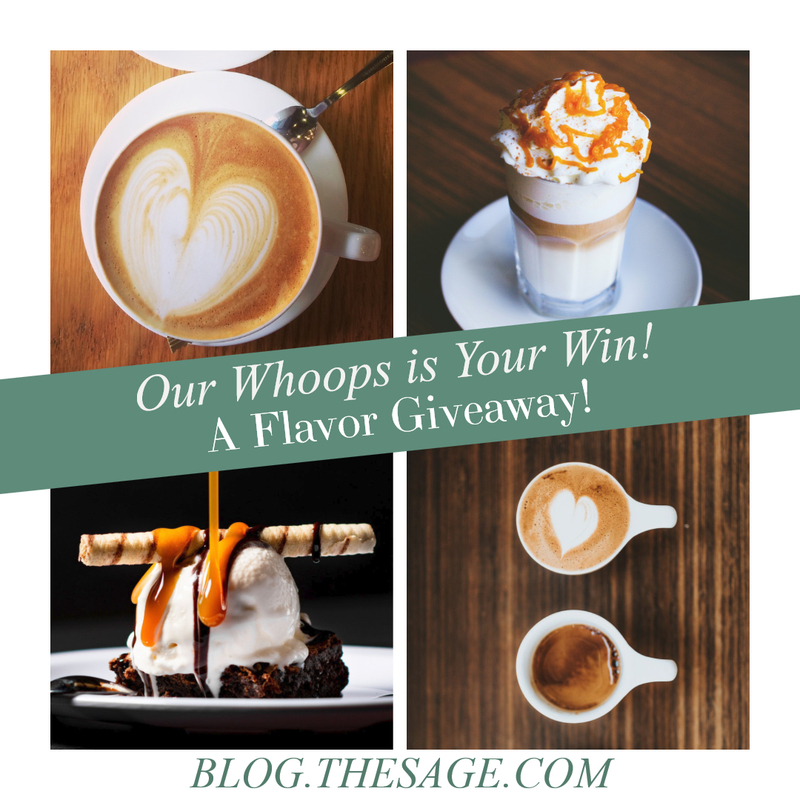 Home » Drawings and Contests » Our Whoops is Your Win! A Flavor Giveaway! Have you ever had a day in your production or testing area where you have had a mistake? When it happens on that rare occasion, it’s a frustrating and embarrassing reminder that we’re human and prone to errors on occasion! We’ve had a whoops when preparing testing samples for evaluators that means our mistake is your chance to win! Here’s how it happened. We had been setting up a spot in our test area to make flavor samples for some evaluators. The day had been a little more chaotic than usual, and we had two people trying to use the same space without checking that someone else had already claimed the testing space. We ended up with two flavor oils in the same testing space and naturally, confusion followed! How did we find the mistake? Like our warehouse, our testing area also fills out production logs to note everything we can about our tests and samples. This mistake was found when our production log was being filled out with the product data, and it was discovered that both flavor oils had been used in the sample production. So we now have several bottles of a flavor that is caramel blended with a hint of coffee that can’t be sent to evaluators for testing purposes. When separate workspaces are available, make sure that you are starting a new project in a clean workspace without other items in your workspace. Always check your workspace for additional items if you had to step away in mid-production. Communicate clearly about used workspaces. Keeping good production/test log notes will help catch mistakes. We’re sharing the lesson we learned so that we can pass this valuable information on to you and because we have several 4 fl oz bottles of flavor oil that you have a chance to win for your own fun projects! So, this is where our whoops is your win! Comment on this post by April 11th, 2019 and tell us about your own production mistakes in the soap lab, lip balm workshop, lotion studio, or even your home kitchen. If you want a chance at a bonus goodie giveaway, tell us what your favorite beverage or dessert is that uses caramel, toffee, or coffee. All comments on this post will be entered into a random drawing on April 12th, 2019 for a chance to win one of these whoopsie bottles! Good luck and may the odds ever be in your flavor! What a bummer for you and a win for us! I love Sticky Toffee Pudding but only when I’m in London. I always make sure I get there at least once a month. Last week I added the wrong fragrance oil to a batch of bath bombs. My biggest mistakes usually involve getting distracted and walking away without taking notes of what I’ve done! My favorite coffee dessert is Frozen Oreo Coffee Cheesecake. An oreo crust, a cheesecake layer, and a coffee, cream and cheesecake swirl layer. AWESOME. Recently I was making last minute batches of baby lotion and Mama’s Belly Butter before sending out a bunch of orders… I was melting oils in two similar vessels, so I labeled them so I wouldn’t get confused. A family member came into the workshop to ask me about something, and since I was in a hurry, I just poured my warmed oils onto the shea butter and started whipping it to make belly butter as I was talking to them. After I had it whipped in, I saw that my beaker of oils labeled ‘belly butter’ was still full – I had dumped the baby lotion oils into my belly butter! My favorite dessert that uses both toffee and coffee are homemade Whole Wheat Toffee Bars – a toffee base, made a bit heartier with the addition of whole wheat flour, and a touch of instant coffee, topped with melted chocolate chips and sliced almonds. Yum! Kelly, your Whole Wheat Toffee Bars sound sublime! So I was making lip balms (5 flavors at once) and had everything all nice and lined up. Flavors in front of the trays, bottles next to the trays and just was ready to go! I guess I went to the wrong shelf (I put fragrance oils on one and flavor oils on another) and grabbed the Chocolate Fragrance oil instead of the Chocolate Flavor oil. Didn’t notice until it was time to put my supplies away. In the mean time I had capped and labeled 50 Chocolate lip balms. Oy! Silly mistake that could have been a million times worse. Lesson learned. Triple check the bottles! I was playing around with some pigments and balm bases from MMS, working with an old lipstick and changing it to be more buttery and changing the color. It worked great until I spilled my melting cup with the tube’s worth of lipstick into my pot of boiling water. When it cooled, I got it all over my hands cleaning it out of the pot. They were bright pink but but they felt very soft. People love my raspberry soap. It is very popular, so several months ago, I made a double batch. A beautiful raspberry color, but oops at the last minute, I accidentally added lavender essential oil instead of raspberry fragrance 🙁 Still a nice soap, but just not the same without the raspberry scent to match the color of the soap. My favorite gelato brand offers a caramel cookie crunch, yum!! Oh shoot! I hate it when that happens!